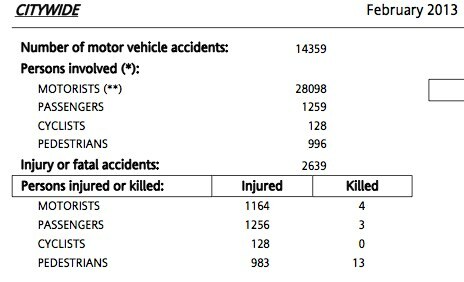 Twenty people were killed in New York City traffic in February, and 3,531 were injured, according to the latest NYPD crash data report [PDF]. As of the end of February, 33 pedestrians and cyclists have been killed by city motorists this year, and 2,408 injured, compared to 23 deaths and 2,392 injuries for the same period in 2012. Citywide, at least 13 pedestrians were fatally struck by drivers in February: four in Manhattan; one in the Bronx; one in Brooklyn; six in Queens; and one in Staten Island. Among the victims were Bujar Hasimja, Shu Ying Liu, Carlos Carlo, Ryo Oyamada, Martha Atwater, John Eberling, Amar Diarrassouba, an unidentified man in Queens, and an unidentified woman in Manhattan. No cyclist fatalities were reported by NYPD. Of nine fatal crashes reported by Streetsblog and other outlets, one motorist was known to have been charged for causing a death: Viveshdyal Thakoordyal was charged with manslaughter and driving while intoxicated for the crash that killed John Eberling. Carlos Carlo was struck by a hit-and-run driver who was not immediately caught or identified; Ryo Oyamada was killed by an officer driving an NYPD cruiser. Historically, nearly half of motorists who kill a New York City pedestrian or cyclist do not receive so much as a citation for careless driving. At least one child and five seniors were killed by motorists in February: Amar Diarrassouba, 6; Bujar Hasimja, 72; Shu Ying Liu, 69; Carlos Carlo, 65; John Eberling, 76; and the unnamed Queens victim, whose age was reported as 67. Fatal crashes occurred in City Council districts represented by James Oddo, Elizabeth Crowley, Ruben Wills, Jimmy Van Bramer, Steve Levin, Rosie Mendez, Eric Ulrich, Melissa Mark-Viverito, and Speaker Christine Quinn, according to crash data compiled by Streetsblog. Across the city, 982 pedestrians and 128 cyclists were reported hurt in collisions with motor vehicles. Per NYPD policy, few of these crashes were investigated by trained officers. Four motorists and three passengers died in the city in February; 1,164 and 1,256 were injured, respectively. There were 14,359 motor vehicle crashes in the city in February. NYPD issued 6,495 speeding tickets in February, 1,107 citations for failure to yield to a pedestrian, and 9,288 tickets for tinted windows. Download February NYPD summons data here. Below are contributing factors for crashes resulting in injury and death. Crash and summons data from prior months is available in multiple formats here. I hate to keep bringing this up, but I thought we were supposed to get data on those injured in motor vehicle crashes AND bike crashes under City Council legislation. If data on bike crashes is ever released separately, it will just generate dozens of bikelash articles as if it is the primary problem. Kind of like all that politicking around a few unfortunate incidents on the subway. I want to see it side by side with the data above. 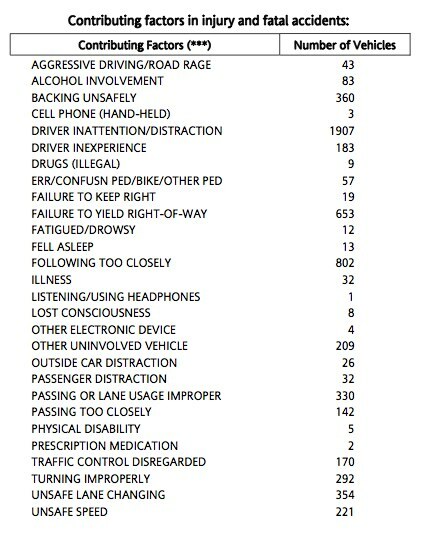 And with data on injuries and deaths caused by pedestrian trips and falls with no motor vehicle or bicycle involved. The NYPD issued 37 citations per day for failure to yield to a pedestrian. If I had a ticket book, I could match that rate on my own without even going out of my way.